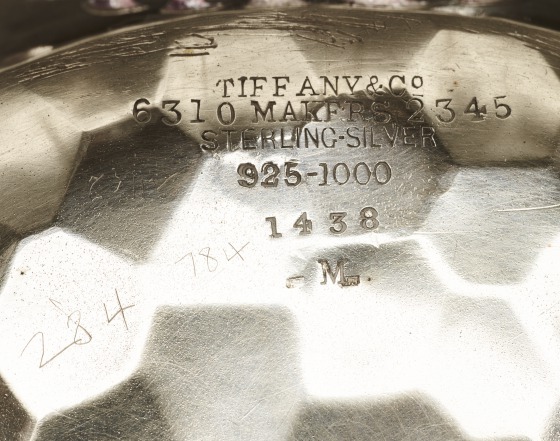 In 1878, Tiffany & Co. won the grand prix for its Japanese style designs at the Paris Exposition Universelle. 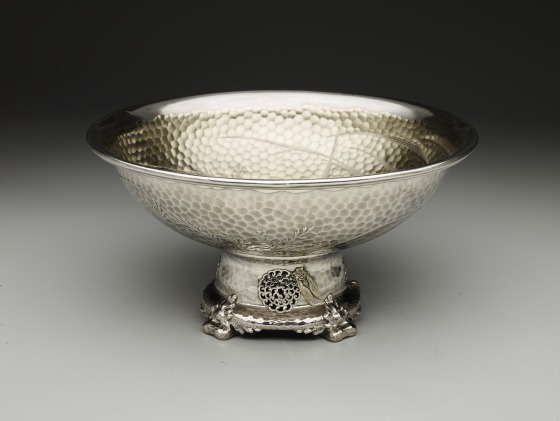 The firm attributed the achievement to the use of hammered surfaces, a technique first used by one of its silversmiths in 1876. 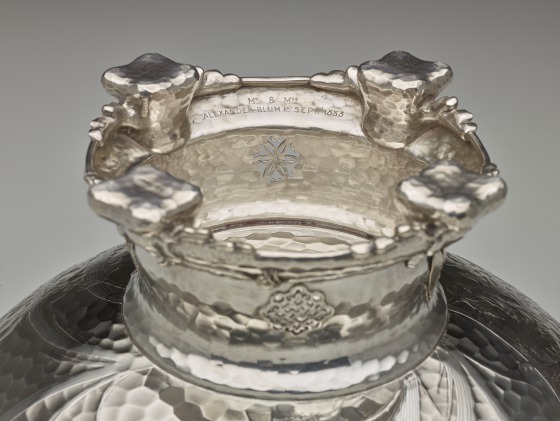 A contemporary issue of the International Review reported, "A peculiar effect wrought in conjunction with applied ornamentation, engraving, or even chasing, is produced by leaving the entire surface... impressed with the dents of the hammer. This unique finish imparts to the body the appearance not unlike that possessed by Japanese 'crackle' pottery, and it certainly owns a quaint barbaric beauty." Covered by hammer marks, this monumental punch bowl is typical of Tiffany's contributions to the style. 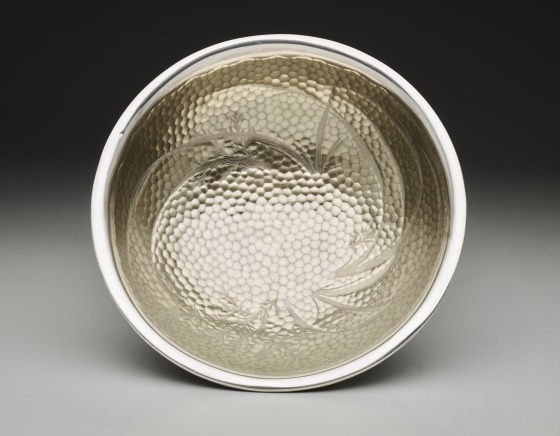 Motifs inspired by Japanese art, such as the plants engraved and chased on the bowl and the dragonfly, cicada, and beetle applied to the stem, complete the design. 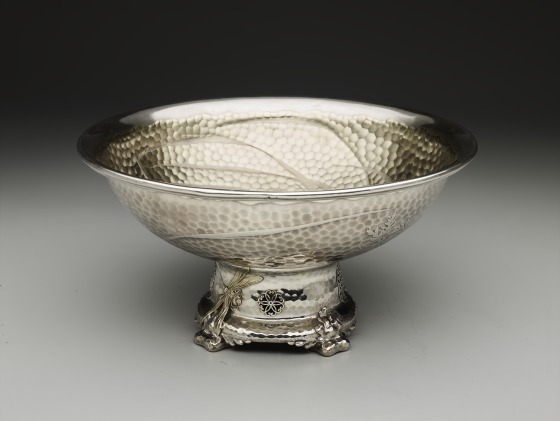 Charles L. Venable, Silver in America, 1840-1940: A Century of Splendor (Dallas, Texas: Dallas Museum of Art; New York, New York; Harry N. Abrams, Inc., 1994), 176. David Carew Huntington. The Quest for Unity: American Art Between World's Fairs 1876-1893 (Detroit: Detroit Institute of Arts, 1983), 202. 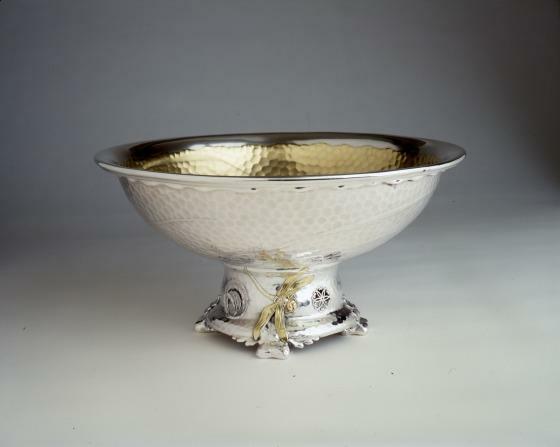 Museum of Fine Arts Houston ~ View a related Tiffany & Co. punch bowl. 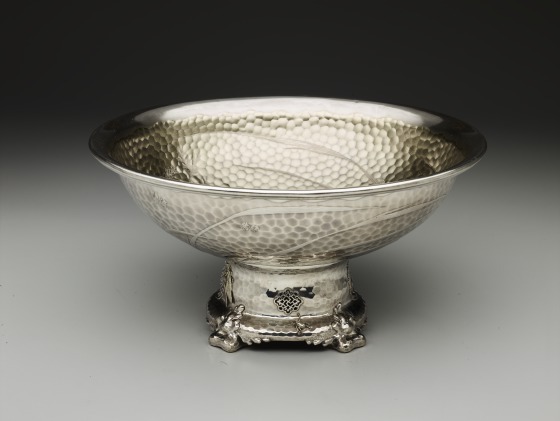 National Geographic ~ Watch the video "The Secret World of Dragonflies" to learn more about the insect depicted on this punch bowl.